There are as many different ways to make ring slings as there are moms who make them. I have spent time working out a way that works best for me, in hopes that other moms will like it as well. I have tried many different types of baby carriers and find ring slings to be the most comfortable. I have used commercially sold front carriers, hip carriers, backpacks and pouches. I have also used ring slings and pouches from other websites. All of the commercially sold carriers left me with a sore back or sore shoulders. Ring slings are always my go to carrier from birth up until around three years old. I find them to be the fastest and easiest to use. I am a babywearer. My preferred carriers being- ring slings first, mei tais when they are small, soft structured carriers when they get bigger and wraps around the house. You may run into me posting on babywearing boards. I love carriers as much as you do. I have worn all six of my children! Why buy a SweetPea Ring Sling? Babywearing has become increasing popular over the last few years and that has led to many options for babywearing! I started making ring slings in 2006 because I found ring slings to be the best carrier for myself and my family. My design is based on my own use, as well as my testers. I am an avid babywearer and have worked hard on my sling design in hopes that it works well for others too! There are several different makers of ring slings with different fabrics, shoulders and price points. Ring slings are completely adjustable and will grow with baby. 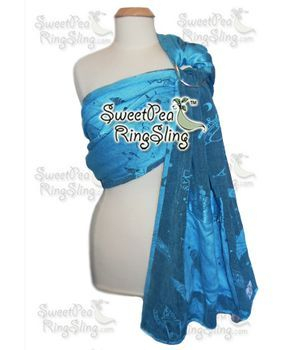 SweetPea Ring Slings are recommended from birth (see newborn safety page) to 35 lbs. The tail of the ring sling provides an excellent cover for nursing or to block the sun. You can also wrap the tail around the rings. All SweetPea's come with the option to add a zippered pocket in the tail (excludes seasonal water slings). Each SweetPea Ring sling is made from two pieces of fabric, for extra strength. There is no 'wrong' side to the fabric. Because of the way that SweetPea's are sewn, there is no top stitching along the rail of the sling. Before making my own ring slings, I found that top stitching dug into my baby's chunky legs. My design eliminates this uncomfortable problem. All SweetPea Ring Slings are made with the shoulder. This shoulder style is pleated and very lightly padded for comfort. My shoulder is specifically designed to cup the edge of your shoulder. There is no other shoulder like it on the market. Each shoulder is completely reversible, giving you two looks in one with each ring sling! All of my fabric has been prewashed in dye/perfume-free baby friendly products. You can use your sling right out of the package and there will be no shrinkage when you wash your sling at home. I use different methods of stitching, not just a straight stitch. I use more secure stitching patterns. Each sling is double stitched, internally, all the way around. It takes me over an hour to sew each sling. All SweetPea Ring Slings are made with the Eclipse shoulder. This shoulder style is pleated and very lightly padded for comfort. My shoulder is specifically designed to cup the edge of your shoulder. There is no other shoulder like it on the market. Each shoulder is completely reversible, giving you two looks in one with each ring sling! All of our fabric is pre-washed and pre-shrunk using fabric softener that is free of all dyes and perfumes. Our house, seamstresses and our sewing studio is smoke free! Each of my ring slings are made from 2 1/4-2 1/2 yards of fabric, on each side. This is enough fabric to wrap around most moms and babies with extra fabric left over, as the tail. You can special order a longer sling if desired, at no additional cost. One price for all sized parents! Each sling is approximately 30 inches wide (unless otherwise noted), more than enough fabric to securely hold your baby. All SweetPea Ring Slings are made with two layers of fabric. This allows for style, support and the proprietary reversible design of SweetPea Ring Slings. All SweetPea's are 100% reversible! Artisan Slings are made from two solid colors and have a trendy print on the tail. I only use high quality fabrics. Be extra cautious with slings that you order over the internet. You need to be sure that the fabric is of high enough quality to support your baby. My fabric selections have been tested for longevity for over 10 years! Each ring sling is made with two, light-weight, 3 inch unwelded, aluminum rings. I use the larger rings because I think they are more user-friendly. The rings are specifically made and tested for baby carriers. Each batch is load tested with 150lbs but have been tested to hold up to 1500lbs without breaking. The rings are completely lead free and made from aluminum 6061-T5. Each of my slings are double-stitched at all areas and the shoulder is reinforced and stitched many times for safety. My stitching around the body of the sling is done internally. This means there are no outside seams that can dig into your baby's skin. It takes me over an hour to prepare each sling. Beginning in 2013 all SweetPea Ring Slings were made with a date of manufacture tag, If you are trying to buy a used sling, please check how old it is! All fabrics wear out over time. *do not copy my shoulder style for personal or commercial use. The SweetPea Shoulder Style is made for a double layered sling and works well with wraps thin enough to be double layer. Double layer wrap conversions, with the SPRS Eclipse (reversible) shoulder are $32 to convert. I can also do single layer wrap conversions, with a gathered shoulder for $26. Return shipping, added pockets and specialty colored rings cost extra. If however, you are still unhappy about your purchase slings may be return within 2 weeks (postmarked) but must be in the same condition as when the sling was shipped to you. I will refund your payment price*, minus shipping fees. Please email me for the shipping address. 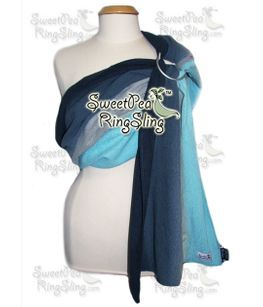 SweetPea Ring Slings is not responsible for any injuries that occur while using your sling. Please read the instructions page before using your sling. Just like any other baby device, ring slings need to be used safely and properly. Your child's safety is your responsibility. You should always be able to see your baby's face while wearing your baby, to ensure proper breathing. A baby carrier should mimic how you would hold a baby in your arms. You baby's head should be 'visible and kissable'. The baby should be worn 'high and tight' on your body. Periodically check seams for any wear. All fabric can wear out overtime. Be especially cautious of this when buying used slings. Do not use the sling around open flames or while cooking! Fabric is flammable. Please don't make me write more disclaimers then this. Proudly Made in the USA. Proudly Spreading the Love by Shipping all over the World!